This set includes a beautifully etched colour metal cockpit and external enhancement set produced in the Czech Republic that really is a work of art. 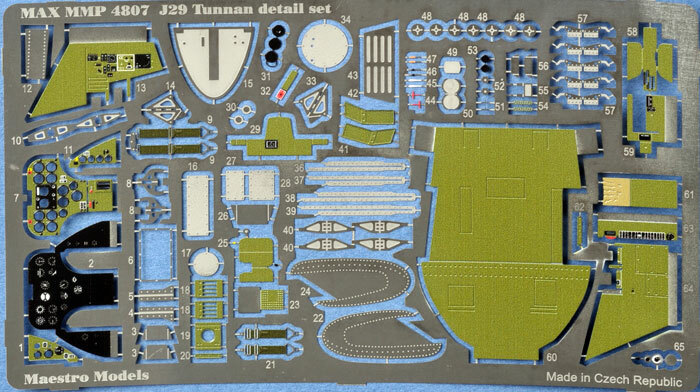 The set comprises of 94 etched parts that replace the cockpit tub, side walls, instrument panel and side consoles. This set totally replaces the cockpit except for the ejection seat and is a vast improvement over the kit supplied parts. While AZ supply both an injection moulded plastic cockpit and a resin cockpit that includes a photo etched instrument panel with a photo instrument backing, this set from Maestro is far superior and more accurate than the kit supplied parts. The instrument panel is made up of coloured wafer parts that represent the instrument faces and panel. The remaining parts make up the throttle quadrant, map case and various cockpit panels. The set provides an etched metal seat harness to replace the harness moulded to the resin seat included in the kit. There is some intricate folding required but anyone experienced with etched metal should be able to assemble the cockpit easily. The exterior gets a work over as well. Replacement scissor links are provided for the undercarriage legs, as are dust cover caps for the brake pistons. Hinges and brackets are supplied for the main and nose undercarriage doors. The kit’s wing fences get replaced by more accurate etched metal parts and finally a myriad of eternal panels and vents are supplied to enhance the exterior of the kit. This set will enhance the detail of the kit and look great when complete. Overall, this is another excellent product Maestro models.